Looking to change up your acoustic guitar tone? 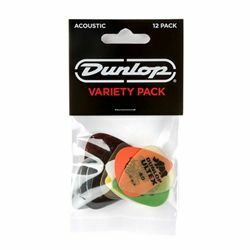 This Dunlop pick variety pack is the best place to start your experimentation. It features a selection of 12 picks that perfectly complement the tone and playability of acoustic instruments. From warmer materials such as Nylon to brighter materials such as Ultex, this pack has all you need to refine your unplugged sound.